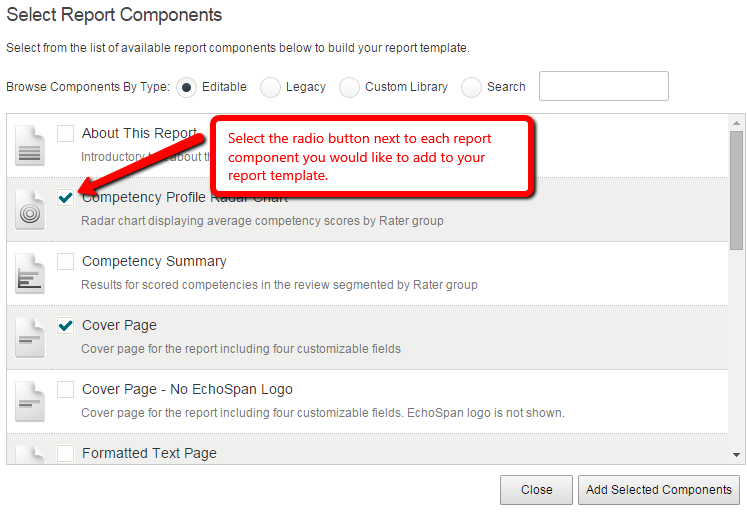 You can add report components to any of your custom Group Report templates. These components can be moved around in order and customized once added to your template. Click the "Insert a Report Section" button at the top of the page to insert a new report section. By default the system will display EchoSpan's editable report components. Check the radio button next to each section that you would like to add to your open template. You will be able to preview, edit, and remove the section as needed, once it is added. NOTE: There are two types of components that can be added to your Group Report template. Components from different sections can be used together. Editable - New editable report components. Custom Library - Components created for your account by EchoSpan's development team. By default this list will be empty. Click the "Add Selected Components" button at the bottom of the window.